The 15 Alice Lane Annex building located at the corner of Alice Lane and Sandton Drive in Sandton has received a complete makeover. 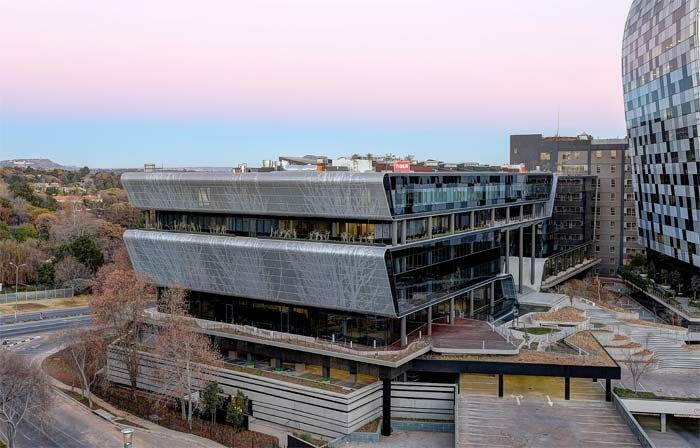 The redevelopment by Zenprop Property Holdings has seen the Annex converted into a AAA-Grade building with a 4-Star green design rating to boot. 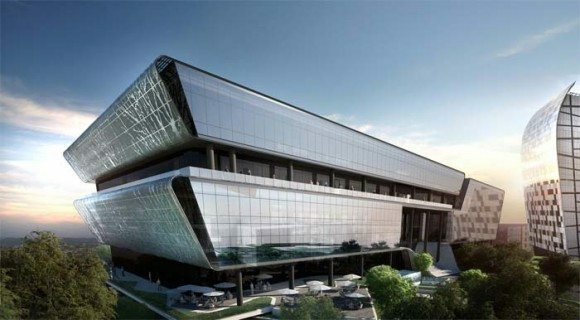 The Annex is an impressive structure with its modern aestheticsconsisting ofan oblong-shaped design style visible from the Sandton City shopping center, Johannesburg, South Africa. The building originally consisted of five structuresthree of which were retained and converted to parking lots;an additional level of parking space was added on top of the building together with 5 storeys that increased the floor area to 4,200 square meters. The length and width of these plates created a need for an internal atrium that now brings natural light and reduced the plates into usable dimensions, explained Paragon Architects the architects of the Alice Lane Annex. The glazed curved corners of the wall, softens the internal and external forms at each end, completing the massive off-shutter concrete walls, flaking at the main entrance. The full height aluminum screens on the ease and west elevations deflect the sun’s rays during sunrise and sunset. The glass façade and unique of this prestigious design gleams proudly next to the well-known Alice Lane Towers. From the external view, the geometric façade incorporation of this design and linear type sections makes the buildings seem like they are only joined together by a series of columns. These linear and geometric shapes and design elements are carried through to the internal areas of the building as well. Externally, the landscape of the building is complemented by the external planting and cascading levels which reduce the elevated scale of the entrance and gives it a more natural look.Not only, does the glazed soft curved cornerscomplement the landscape of the building but when walking up the stairs towards the main entrance, the landscaping elements further mimic the architecture through geometric and triangulated shapes of glass and planted beds. The neutral tone of the “Powder Grey” shades and the clean simplified lines of the rectangular benches outside the building compliment the architecture and landscape. The third floor’s perimeter is lined with fifty nine custom made rectangular planters in a “soot” shade. The stunning moment about the Annex is when one sees the beautiful external landscaping of the Alice Lane Towers, where sugar bowl pots and ulterior table benches have been beautifully settled amongst the outdoor areas. The Alice Lane Annex was completed mid last year and currently has one tenant occupying the first three and half levels of the building, with the two serving as the new home for a separate tenant. The Annex was constructed next to the Alice Lane Towers. Not only were the two buildings an excellent sketch on paper, butthe landscapes of both building were redefined, complimenting each other perfectly. Also the igneous concrete furniture outside brings out the beauty of each development.